Announcing the Heart Beat EP - Can You on BBC radio tonight! I've been holding off an official announcement about our Heart Beat EP until I had all the pieces in place, but an exciting development has made me move things up a couple of days. Yesterday we finished mixing and mastering Can You?, which is going to be the first track you'll hear from the EP. I sent it to a couple of DJs, and uploaded it to BBC Introducing, expecting to hear back in a few weeks... but then I got an email last night telling me that BBC Sussex are going to play it tonight! 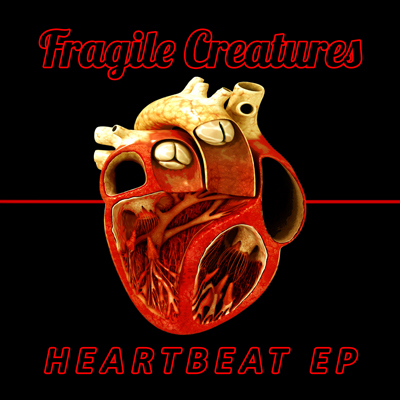 Heart Beat EP is the first fully independent release from Fragile Creatures, it's going to come out on May 3rd, but will be available for pre-order from April 5th, with 'Can You?' immediately downloadable using the iTunes 'instant gratification' thingamajig! Not only are we releasing this ourselves, we also recorded it. When our album came out, three years ago now, I was frustrated by how long everything took - so James and I bought various bits of recording equipment and, using all the information we could find from YouTube, and things I'd picked up looking over the engineer's shoulders in all our recording sessions, we figured out how to do it ourselves. It's so exciting that a song we recorded from scratch will be played on BBC Radio... and it's amazing that is happening just 24 hours after the mix was finalised! It would mean the world to me if you could listen in tonight and text/tweet the show to let them know you're there. And also please get back to us afterwards, and let us what you thought of the song and the sound of it. Have we managed to pull this off? Only time will tell. Seeing as there is a massive petition growing on parliament's website at the moment to revoke article 50 (currently 4.4 million have signed), and a huge march in London today, calling for a People's Vote/Second Referendum (which I sadly could not attend), I thought I'd have a bit of fun and make a playlist on the theme! We're probably not going to use Soundcloud for future releases, but, we are going to keep these demos we did at Church Road here, and the early singles. If you've not heard them yet give them a listen, you might recognise these from live shows. This is where we're going to post all the Fragile Creatures updates and musings your heart could possibly desire!